A one-day 'Anzac walk' around Gallipoli. Images of Anzac Cove today. 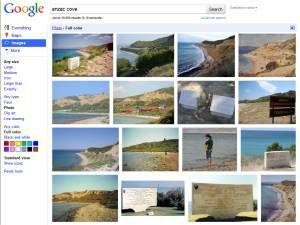 Results of a Google Images search for Anzac Cove photographs. How to get to Gallipoli. Moving your mouse over a photograph gives you the 1915 view. Out-of-the-way evidence of the Gallipoli Campaign. Description of the battle on 25 April 1915, illustrated by photographs of the same areas today. Gallipoli landing reenactment website. Includes some past and present photographs. New Zealand government site on Anzac Day with modern day photographs. Well, not exactly photographs of Gallipoli today - but these photographs from 1934 are probably more interesting. Scroll down to almost halfway down the page. 360-degree panorama images that include Anzac Cove, Ocean Beach, Lone Pine Cemetery, Plugges Plateau, New Zealand trenches on Chunuk Bair, Hill 60, Hill 971, Quinns Post, Shrapnel Valley Cemetery. Click on 'View' then drag on the photo to see the image as an interactive panorama. Joint Australian, New Zealand and Turkish teams have found Roman artefacts and World War 1 relics at the sites of Gallipoli battlefields. The story focuses on trenches and the story of Corporal Alexander Stewart Burton and two others who were awarded Victoria Crosses. "Photographer Mark Spencer’s work with Australia’s leading maritime archaeology team has uncovered a number of new shipwrecks at Anzac Cove." "In a marked contrast to controversy over Turkish roadworks at Anzac Cove in 2004, the Federal Government has welcomed the Turkish government's plan to build a 600-metre sea wall later this year..."